One hails from South America and another from South Africa, but both of their health benefits and growing popularity point North. Exclusively grown in Argentina, Brazil, and Paraguay, yerba mate (Ilex paraguariensis), pronounced “yer-BAH mah-TAY”, is the National Drink across the region, where at least 90% of the population drinks this holly plant daily. Focused predominately in Southern African regions, rooibos (Aspalathus linearis), pronounced “ROY-bos”, can surely be considered the “green tea” of the area—more apt, the “red bush,” as the oxidized leaves of this legume plant — grown within the mountains of the fynbos shurbland — produces a checkered peachy red, brown, and maroon color. How does rooibos compare to yerba mate tea? 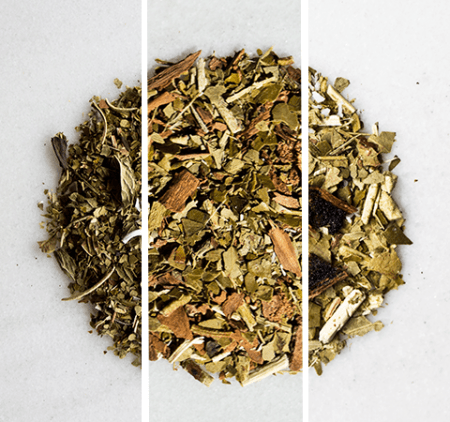 As you may have already seen with our yerba vs coffee and yerba mate vs green tea discussions, yerba mate is now a recognized contender in the pantheon of healthy teas, tisanes, infusions, whatever you’d like to call the heating and brewing of herbs into a tea. I’ll use the term “tea” colloquially, without limiting it to the Camellia sinensis plant (traditional green/black tea). Today, we’ll discuss yerba mate vs rooibos. Whether you’ve been forced to give up coffee by your caring wife or concerned doctor, or you’re a part of the growing interest in health remedies that stretch life and boost the immune system, we’ve got you covered. And in the spirit of full disclosure, we are providers of yerba mate and rooibos, namely with our delicious Princely Peach Rooibos blend. We provide this article as educational information only and never to replace the advice of your doctor. Now on to the flavors! Since there’s no fun in drinking a tea that tastes like cough syrup, notwithstanding any health benefits, let’s first compare the tastes of each herb. Luckily, both teas are delicious, which can’t be said for all medicinal herbs. 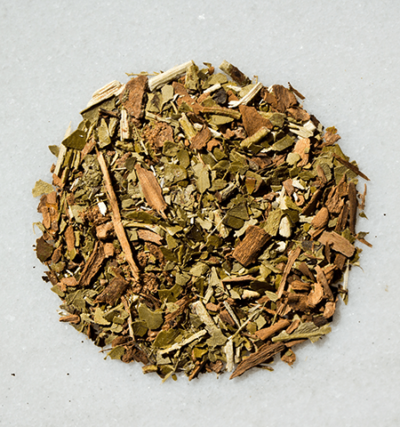 Yerba mate (Argentine) is usually robust, earthy, muscular, and herbaceous, with delicate layers of sweet and rich tones — depending on the variety, some mate tastes sour (Paraguay) and other taste dank, malty, and creamy (Brazil). Generally, expect something along the lines of a strong and complex green tea. Rooibos is lighter and more buoyant in nature. Significantly less robust and earthy, there’s a fruity levity and crispness backed by a heavier creamy and viscous earthy body, with whispers of floral and tangy elements. Think peaches, chicory, and maple syrup with some essence of black tea. First it must be stated that both plants have a long way to go with pharmacological investigation. Attention has only recently been renewed with these herbs, despite their long tradition and rich folklore of healing properties, passed down from generation-to-generation. Both herbs have an impressive list of antioxidants and polyphenols, beneficial molecules that fight disease, boost immunity, and retard the aging process. Now, it’s one thing for a plant to have antioxidants and it’s a completely different matter when discussing the “antioxidant capacity” of the herb—the actual measurable effect of the plant’s nutritive ability after it has successfully entered the blood and passed through the body’s natural breakdown, or digestive/metabolic, pathways. Both plants have shown quantifiable health benefits, but discussing them all is outside the scope of this article. We’ll discuss the primary compounds — or the compounds mostly associated with the herb — to highlight the plant’s hallmark health applications. 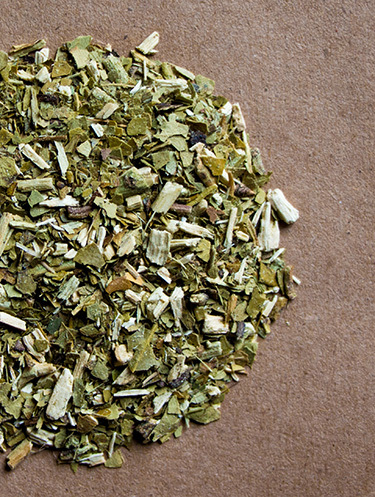 Yerba mate, easily eclipsing green tea in active compounds, contains one antioxidant of particular note, chlorogenic acid (CGA). The science is still being worked out, but many yerba mate researchers believe that CGA, coupled with another group of compounds known as saponins, are behind the powerhouse of mate’s ability to boost the immune system, combat free radicals and cancer cells, as well as improve the overall health of the body. CGA has been related to promoting a healthy heart and reducing dangerous fats and lipids that clog arteries and lead to high blood pressure. Mate may also fall into a category of herbs known as adaptogens, that are among the Earth’s treasure chest of herbs that normalize stress (internal and external — bacteria, viruses, depression, anxiety, etc.) and restore the body to optimal functioning. Unique to rooibos, aspalathin may be a contributing factor in the plants ability to “significantly increase the antioxidant capacity in the human body, thereby boosting the body’s natural defense,” as stated in a study published in “Food Chemistry”. A conclusion that parallels Dr. Mejia’s, the foremost mate scientist, research that claims mate’s ability to increases the solubility of vitamins and nutrients in the body. Effectively, both plants can boost the overall pool of antioxidants in the body, reducing a process known as oxidative stress which naturally occurs when free radicals (harmful molecules) begin to surpass antioxidants (helper molecules). Unlike yerba mate, rooibos is caffeine free (though the caffeine in yerba mate appears to work differently, without crashing or jitters). Volunteers in a South African study were shown to have elevated glutathione levels “by 100%” by drinking 6 cups of rooibos daily — results pointing to a growing pile of evidence that suggests rooibos may play a role in reducing heart disease and cancer. Reducing risk of heart disease and lowering blood pressure (cardioprotective). Normalize sugar levels for diabetics. On a personal note, having consumed these herbs for several years, and despite their wide-ranging health benefits, I tend to enjoy yerba mate primarily for it’s ability to energize the mind and body while enhancing focus and concentration—something between the effects of coffee, chocolate, and green tea, but without having to worry about drinking too much, as there are seldom, if any, crashing effects. As for rooibos, what appeals to me most is the natural delicate sweetness and fine subtleties of flavors—akin to a light summer wine of the tea world. It’s one of the most elegant and delicious herbs I’ve encountered, usually having a soothing and calming effect on my system. 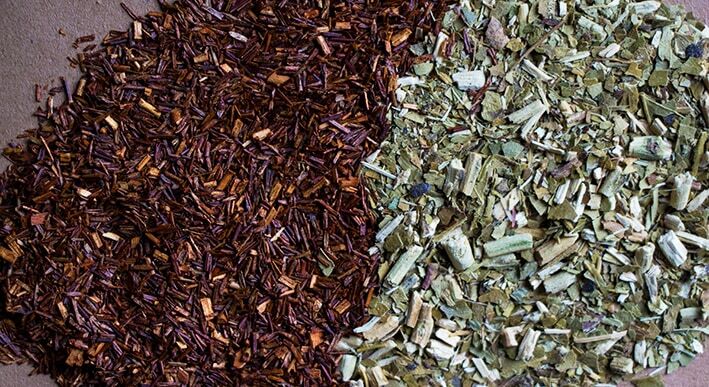 Both yerba mate and rooibos are powerful herbs, full of health benefits and brimming with delicious flavors to explore. Though the science around yerba mate does look more promising as to the overall superiority of the herb, we mustn’t be so quick to categorically state that one tea is “better” than the other. Herbs, with their myriad entourage of compounds, never work in a vacuum. While yerba mate has CGQ and saponins, and rooibos aspalathin and nothofagin, both plants share unique methods of boosting the immune system and thwarting the aging process, with promising research on their ability to fight and prevent cancer, both herbs are worthy of a shelf in your tea cabinet.